Commentary: "...I would like to say to the people of your community that they would be wise to look to the future in decisions that affect the very soul of St. Paul and what they would leave as their heritage for generations yet to come." A number of challenges will confront the new mayor of St. Paul, Chris Coleman, including how to fill vacant downtown office space. Saint Paul's occupancy rate improved slightly in 2005, but still lags behind other parts of the Twin Cities area. One of the city's landmarks, the First National Bank Building, reflects both the uncertainty and the promise of Saint Paul's business future. St. Paul, Minn. — When Mayor Randy Kelly stepped to the podium to tell his election-night supporters there would be no second term for him, he said he'd spent some time that evening gazing out at the buildings of downtown. "When you look at the skyline of this beautiful city of ours on a pretty night like tonight, you all know what you see first. And that's a flashing red light. And it goes First, First, First, First. It's good to answer the question that that skyline asks, and that's 'What comes first in St. Paul?'" he said. Kelly went on to say the will of the people comes first in the capital city. But when St. Paulites travel, the first indication for many that they've returned home is the blinking of that neon "one" atop the First National Bank building. The number has served as St. Paul's beacon for more than 70 years and the First National building was the city's tallest for 55 years. Its builders had some trouble getting materials back in 1930. It seems suppliers were preoccupied with an eastern skyscraper going up at the same time called the Empire State Building. A modern-day visit to the foot of the one yields an excellent view of St. Paul. A thicket of attennae and satellite dishes quivers in the wind behind a chain-link fence, dwarfed by the 50-foot number that sits about 500 feet above Fourth and Minnesota Streets. 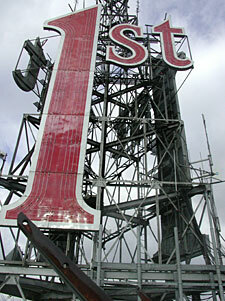 A rusted sign welcoming visitors is a remnant of a bygone observation deck. Things have also changed inside. The building lost the successor to its namesake tenant a few years ago when U.S. Bank moved its St. Paul offices to a new facility across the Mississippi River. The owner then fell behind in payments to the building's mortgage holder, who recently foreclosed. The ownership turmoil and empty offices have caused some consternation, but the president of the St. Paul Building Owners and Managers Association, Bill Buth, thinks the First National Bank building will be fine. "Some would say it is tired. I would say it's aged very well, as we all hope to do. And there's some real history to it. You won't see some of the architecture that is on the exterior and the interior of this building anywhere else in the city," according to Ruth. Buth's office is in the First National Bank building. He says the space below his 29th-floor window once contained a deck where bank executives gathered to share cigars and drinks after closing time. A passage built in the 1940s to link the building's towers is said to be the first-ever skyway. Historic character, along with a parking ramp and proximity to government offices are potential selling points for the First National Bank building. But whether its offices fill up again depends more than anything on job creation in St. Paul. Buth's group prepares an annual report on office occupancy in the city. He says this year's numbers showed slight improvement following a slump in the early part of the decade. "When the economy got shaky, instead of kicking out a wall and taking on another 10,000 square feet, owners were putting two more desks into the same amount of space they had with one person because they were unsure of what was going to be happening. Is it still shaky or unshaky today? It depends upon how you look at the glass. Is it half full or half empty?" Ruth said. Tom Stella, a vice president with United Properties, says real estate developers are optimistic that the Twin Cities office market has hit bottom and is starting to recover. Stella expects the rebound will be evident at suburban properties first and will take awhile to spread to the high rises clustered in downtown St. Paul. "Those buildings aren't very efficient for large users because you're going to be spread over a number of floors, where if you go to the suburbs and they build new buildings with 25, 30, and 40,000 square foot floor plates, those are attractive because big businesses can get into one floor or two floors and be more efficient," according to Stella. About 88 percent of St. Paul office space was filled this year, but if you disregard government offices and owner-occupied buildings, landlords leased only 78 percent of their available space. Stella says Chris Coleman has the benefit of stepping into the mayor's office at a time when the commercial real estate tide seems to be coming in rather than going out. "So from that aspect, sure, he should be happy that we're looking towards the future. But we're not out of the woods yet, by any means. We're still nearly 23 percent vacant. And that's a lot of office space that needs to be back-filled before we start seeing any improvement," Stella said. A spokesman for the mayor-elect says Coleman is concerned about St. Paul's office vacancy rate and will work on lowering it once he takes office.